Home > Wildlife > Grey seals in Cornwall taste freedom again…..
Grey seals in Cornwall taste freedom again…..
…..first reports back suggest it tasted salty. During the winter months, British Divers Marine Life Rescue (BDMLR) are busy answering calls from the public informing them of young Grey seals, Halichoerus grypus, injured and stranded, many from the increasing swell we are seeing during the last few years winter storms. 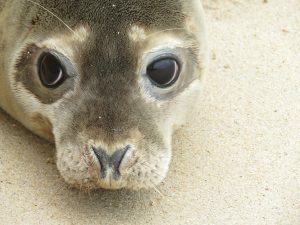 In a carefully coordinated effort, volunteers from BDMLR and the Cornwall Seal Sanctuary, Gweek, Cornwall, UK work together to rescue these animals, often requiring scaling perilous cliff faces to reach them. The seals are treated and rehabilitated at Gweek until they are well enough to be released again, where they are flipper tagged to help monitor them in the future, and released back into the oceans from whence they came. Grey seals are one of the rarest seals in the world, and in the UK we are lucky enough to have 40% of that population right on our doorstep. We have both Common and Grey seals as residents on our coast but in Cornwall we are most likely to see the larger Grey seal, with their sweet dog like faces, along our rocky shores. If you wish to report an marine animal that you are concerned about or have a general enquiry about BDMLR, please call 01825 765546 during office hours 9am-5pm Monday to Friday. Any messages left on the answerphone will not be checked until the morning of the next working day. Outside office hours, weekends and bank holidays. Outside normal office hours and over weekends and bank holidays, we operate a rescue line (no general enquiries please) on 07787 433412. Please notice that this number diverts to one of our Out of Hours coordinators and therefore cannot accept texts, voice messages or photographs.